This year in mid-July, the Baghmati, Budhi Gandhak and Lakhandai went into spate in Bihar. In Assam, several districts were engulfed by the waters of the Brahmaputra. Uttarakhand experienced flash floods and waters surged in Uttar Pradesh, Orissa, Gujarat, Tamil Nadu and Karnataka. When this issue went to press more than 2,000 people had lost their lives and there was widespread damage to crops and property in what has been described by the UN as worst floods experienced by the country in living memory. How grave are matters exactly? Have the relief measures been adequate? Could we have done more than arrange ad hoc relief? How adequate is our understanding of floods? Lakhinath Chintae is a prosperous farmer in Kamalbari in Assam's Majuli district. But he and his family face a bleak future. The more than 20 hectares (ha) they own have been washed by the recent floods in the state. Elsewhere in Bordolani block in Dhemaji district, Bejia Das has far serious problems. He had borrowed money from a moneylender for his son's education and had promised to pay back with the earnings from this season's harvest, but the floods have put paid to his hopes. 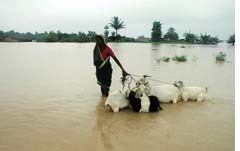 "The floods have been unprecedented this year, even by the standards of wet Assam," Chintae says. Nearly 400,000 ha of cropped land has been lost, though the monetary loss has not yet been calculated. In Dhemaji district, the Brahmaputra river has deposited sand in over 7,000 ha of agricultural land. The Jia-dhal and Gai nadi, flashy rivers arising from the Arunachal hills, have deposited sand over another 5,000 ha rendering the area completely unproductive.But the state agricultural department does not believe that there is a severe crisis at hand. "The loss of agricultural land isn't much. We have till August-end to mend matters," Arshad Hussain, agriculture information officer at the department, said. Hussain, however, says that, there will be some loss in production due to the setback in plantation time. The state government opened more than 3,500 temporary shelters, besides lodging flood-hit people in schools and office buildings and providing essential food items such as rice, dal and salt to the affected. Baby food and medicines were also distributed. 669 relief camps were opened in the state where 1,46,621 people were provided relief. The arrangements are rather typical of the state reaction in other flood-hit states. In Bihar, for example, food packets were air dropped in Darbhanga, Madhubani, East Champaran, Samastipur, Begusarai, Bhagalpur and Khagaria districts--the places completely cut off due to the floods. The packets contained wheat, rice, gur, chura, sattu, salt, candle and match boxes. But says, Vinay Odhar, regional manager Patna, Action Aid, "The government is distributing foodgrains to affected families. It should realise that people affected by floods are in no position to cook food. What they need is dry food." Worse still, inclement weather led to air dropping of food being called off for a few days--a very serious problem considering the magnitude of the food crisis. And then in early August, Bihar's food corporation reported that food supplies from the Food Corporation of India had run short for the over 8 million marooned. Reena Devi of Baluwaha village in Muzaffarpur puts the problem of many like her in perspective: "My family of nine isn't getting food at all. There has been no support from the government." Reena and her family had to rush to an embankment after floods hit her village on July 28. Embankments and the National Highway 57, in fact, became a refuge for many of the flood-hit (see box: Uneasy escape). But the embankments on Bhutani Balan,Kamla Balan were badly damaged.There was erosion in 132 embankments with breaches at 25 points, according to officials figures. The old bunds and important canal systems were also damaged in the floods. Bihar's principal secretary of water resources development department, A K Sinha, has conceded that the embankments have not been properly protected. Today, many in Bihar and Assam have returned back home after the flood waters receded. But only to face a grim future. "We will starve for more than a month. Rice prices have gone up nearly five times, and we have no shelter," says Reena Devi. Tempers have flared. Chief minister Nitish Kumar faced protests and hostile flood victims during his tour of flood hit areas. Deputy chief minister Shusil Kumar Modi's car was stoned by angry flood victims at Motihari. According to media reports, on August 20, about 1,000 people, including women and children armed with sticks, damaged furniture and equipment in the block office at Mahua in Bihar's Vaishali district for not distributing relief. In Sitamarhi district, flood victims led by a local legislator attacked police and administration officials after two youths drowned. They also pelted stones at the police to protest the failure of the administration to provide them boats. On August 12, Bino Sharma, a 35-year old flood victim was killed and over two dozen people injured in clashes with police in Sonbarsa block of Saharsa district.The state's disaster management department commissioner Manoj Srivastava, however, claimed that there was no shortage of relief. As floodwater recedes waterborne, airborne and mosquito related diseases are on the rise. Bihar government health officials admitted that people marooned in embankments and highways lack safe drinking water and this can cause a spurt in waterborne diseases. "People with waterborne diseases are coming to health camps in flood-affected districts," said Arun Kumar Thakur, honorary secretarty of the Indian Medical Association's Bihar chapter. Gita Prasad, Bihar's director in chief of health services also admitted of an increase in water borne diseases. undp's situation report of August 17 notes of 600 cases of fever in Khagaria district. Prasad, however said that there was no epidemic-like situation. The state's voluntary health association affirmed this. The Assam Tribune on July 25, reported that cases of malaria and encephalitis have been reported from five public health centres in the state. 1,500 cases of diarrhoea were registered with government hospitals in Orissa's Balasore and Bhadrak districts. While people in the flood-affected areas are struggling to come to terms with the ravages, the political blame game has begun. In a particularly heated debate in the parliament on August 13, members demanded that the government state what it had done to alleviate matters. There weren't many concrete suggestions: only ones to have more embankments. Aside from the political hullabaloo, state and local authorities have begun to come up with explanations for the floods. "Floods in most parts of eastern Uttar Pradesh were due to heavy rainfall in Nepal," said Randhir Singh, Gorakhpur's district collector. Assam's water resources minister Bharat Chandra Narah ascribed the floods to "abnormal developments in upstream Arunachal Pradesh. The Ranganadi dam of the North Eastern Electric Power Corporation had probably released excess water without giving us prior information." Authorities in the state also maintain that heavy rainfall in neighbouring Arunachal Pradesh and Meghalaya caused the floods. Data of the Indian Meteorological Department (imd), however, shows that only one of the three districts of Meghalaya received rainfall that was significantly above normal. It also shows that only two of the 13 districts of Arunachal Pradesh received rainfall far in excess of the normal. In fact, the department's data indicates that the floods were not necessarily caused by heavy rainfall: precipitation in Assam was less than 99 per cent of the 30-year average rainfall in the state, and most of the flood-affected districts in eastern Uttar Pradesh, Bihar and Gujarat received less than normal rainfall before the floods (see table: The skies didn't exactly open up). imd has its own explanation. "The only floods that took place this year were in Bihar. The others can be described as cases of water logging," said the department's spokesperson B P Yadav. imd's flimsy technicality does not obscure the malaise in the department's workings. "imd provides us data that is three-years old. This is of little value in flood forecasting," says A K Gosain of the Indian Institute of Technology (iit), Delhi who's been working on peak flows in Indian rivers. Officials of the Pune-based National Data Centre of imd say that the centre has monthly rainfall data from 1998 to 2005. But they also said that the centre does not have data for all states, particularly those in the north east. "We don't generate data, only maintain it," Krishna Kumar of the centre said. So, most research on rainfall patterns in the country is based on old information. It is significant research that is in question here. Last year, for example, the Indian Institute of Tropical Meteorology, Pune, came out with a study, which showed extreme rainfall events in Central India are rising, while the average rainfall has remained constant. These are vagaries which imd with its reliance on long-term averages seems incapable of predicting. What accounts for such rise in peak flows? Glacial melting? Dulal Goswami, former professor of environmental sciences at Guwahati University, says, "The floods this time were because of the rains but the snow-melt factor also contributed. Gosain, however, says that "currently there is no direct evidence of waters from melting glaciers causing floods. But this cannot be ruled out in future." So far, there is evidence that some run off the river (high altitude) hydroprojects are receiving increased discharge due to melting glaciers. But there is no direct evidence of floods due to that. There should be more research on increase in water levels due to melting glaciers. River monitoring in Hurla catchment area near Kulu, Himachal Pradesh by iit Delhi scientists shows that flows increase during February to April due to faster melting (see graph: The melt-down factor? ); this does not tally with the rainfall in the catchment. Pratap Chandnani, a hydro-engineer who collaborated with the iit scientists said "rock dams bursting when glaciers melt at a rapid rate are a flood risk". He cites the example of the Parichu dam in Tibet bursting due to sudden glacier melting in 2004. 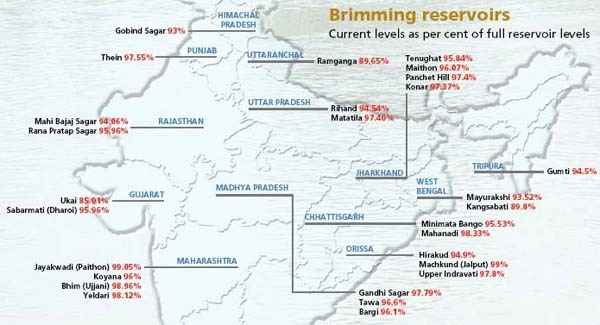 On June 5 this year, just before the monsoon set in, the South Asia Network on Dams, Rivers and People (sandrp) warned that reservoir levels in the country had risen alarmingly. Was this water from excess glacial melt in February and April? Scientists, as we have seen, do not have a definite answer. In any case, barely a week after they were issued, sandrp warnings proved true. "Forty one of the 76 dams monitored by Central Water Commission [cwc] had filled up to 20 per cent of their capacity, according to the commission records updated on June 16. Ideally, the storage level should be 10 per cent or less," says Himanshu Thakkar of sandarp. "In 20 reservoirs, the water level was over a third of their capacity," he added. cwc sources, however, say the commission has a guide curve which specifies reservoir levels: they vary according to a dam's objective and location. "Dam authorities should keep in mind this guide curve and downstream flows while monitoring levels of reservoirs and releasing water from them. We give them regular information from satellite about the amount of water likely to flow into dams. They also have their own sources of information," cwc sources said. Dam authorities maintain that they adhere to the commission's guidelines. But, says K K Sharda, deputy chief engineer of the Bhakra Beas Management Board, uncertain monsoons often militate against this. "For example, this year bad monsoons have kept water levels below the specified levels," he said. Representatives of civil society organisations differ. "cwc is very secretive about information. Of the several dams in the country, it releases weekly data on levels in only 76 dams. Water discharge data in the Ganga-Brahmaputra-Meghna and the Indus basins, for example is secret," Ravindranath of the Assam-based ngo River Basin Friends said. Some civil society leaders point to a conflict between the two basic objectives of dams: electricity generation and flood control. "For electricity generation, authorities have to keep reservoirs at high levels. But flood control calls for low levels. As electricity generation earns them revenue, the authorities try to keep reservoir levels as high as possible. Hence, they are at high levels before the monsoons," said Himanshu Upadhyaya of Intercultural Resources, an ngo that studies floods. R Ramaswamy Iyer, former cwc chairperson, agrees: "Authorities store water for electricity generation. When there are sudden rains, they release it, often causing floods." Questions such as those raised by sandrp and other civil society organisations had been raised earlier: in the wake of the 2004 floods in Assam, West Bengal, Orissa and Gujarat. The Union government's ministry of water resources had, in response, set up a Task Force. "The high sediment load of the Brahmaputa especially during the monsoons, leads to frequent changes in the configuration of the river channel, silting as well as braiding of the channel. This leads to reduction in carrying capacity of the river and overtopping of banks and inundation of surrounding lands, causing floods," was one of the task force's notings. The silt build-up on river beds needs to be estimated regularly to find out if they are rising. However, apart from some estimation of the silt buildup in the lower water levels of the Brahmaputra after the earthquake of 1950, there has been no regular estimation of silt carriage or increase in the height of the river bed. 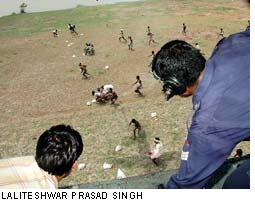 "In some places in Bihar the river bed is above the ground level. It is very difficult to keep a regular estimation of such things," a planning commission official said. There is no effective method of flood forecasting in India so far," said Gosain. Thakkar suggests that latest technology and local network be used in flood forecasting and cites the example of the River Basin Friends which has been forecasting floods in the Brahmaputra basin for the past three years. The ngo's central hub at Village Akajan in Dhemaji District of Assam collects information from different sources and peoples' network in upstream locations of the Brahmaputra and its major tributaries over phone and through email. This information is then processed by corelating it with different background information, statistical and operational analyses. The final flood early warning messages are then formulated for different vulnerable locations and disseminated through different media.